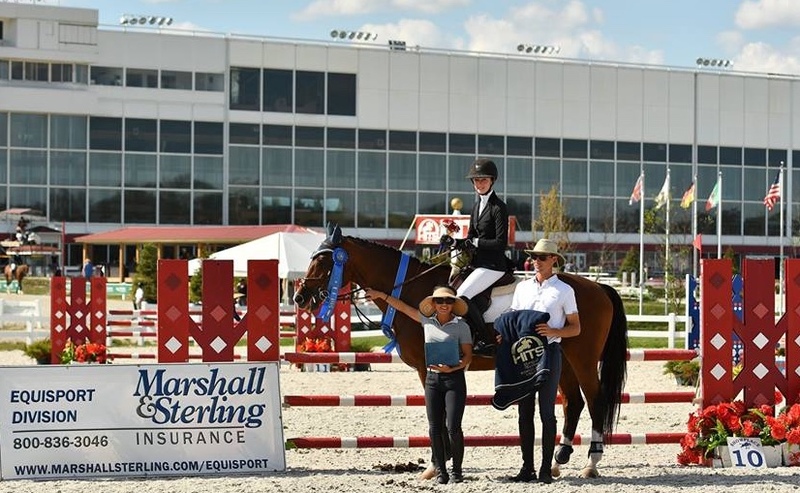 Paige Matthies with trainers Melissa Hirt and Gabriel Rodrigues swept the junior medal finals winning the IHJA Junior Medal Final, the M&S Junior Medal Final and the M&S Junior/Amateur Horsemanship Medal Final at HITS and Showplace Productions' Fall Classic Championship Weekend. 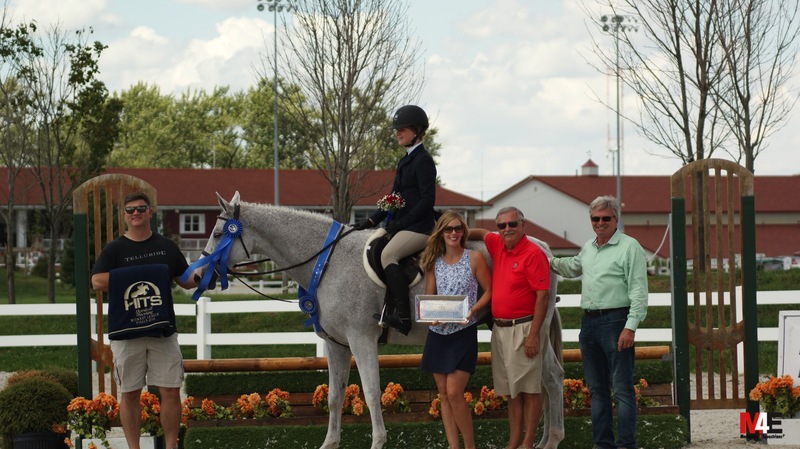 Crete, IL – September 16, 2018 – The bleachers were full to cheer on barn favorites for the numerous awards and championships presented at the Showplace Fall Classic Horse Show at HITS Balmoral Park. Riders were eager to see show manager Patrick Boyle’s always creative finals course design center stage in the HITS Chicago grand prix ring. 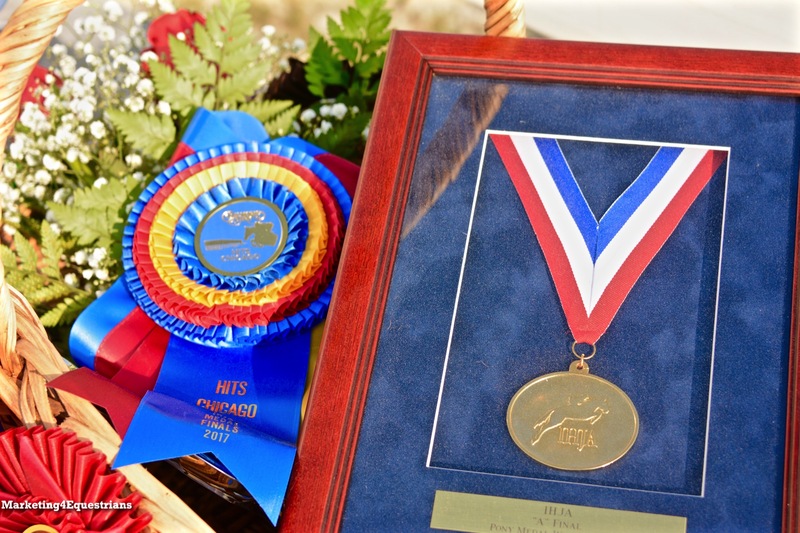 Championship ribbons were lined up waiting to be handed out for the final Marshall & Sterling (M&S) Midwest championships, the Illinois Hunter Jumper Association (IHJA) Medal Finals and the Zone 5 Horse of the Year Awards. 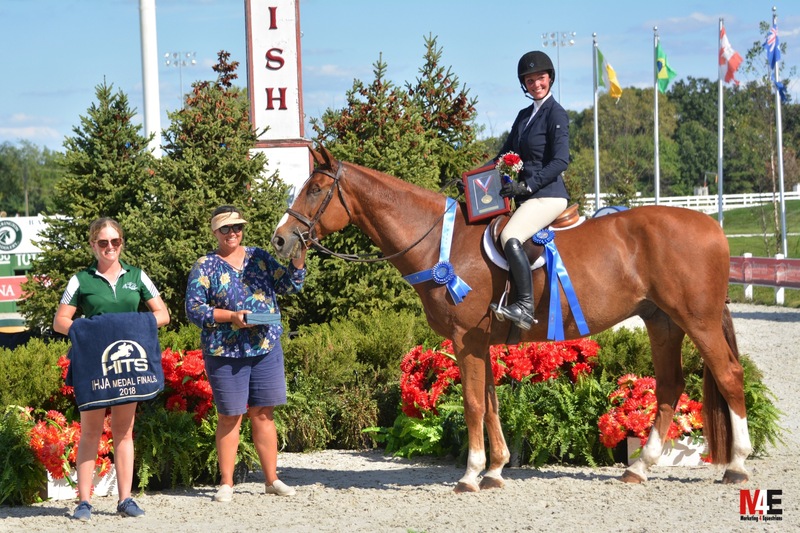 The horse show is deemed a favorite for riders, due to the amazing effort Boyle and his staff extends to make the day memorable and give riders continuing on to the medal regionals and indoors, a fantastic preparation opportunity. The courses are beautiful and challenging and the awards and presentations are the trademark Showplace “Production”. Riders in the IHJA Medal Finals all took a swing at the course, complete with a chute to ride through and plenty of eye-catching brush and ferns. 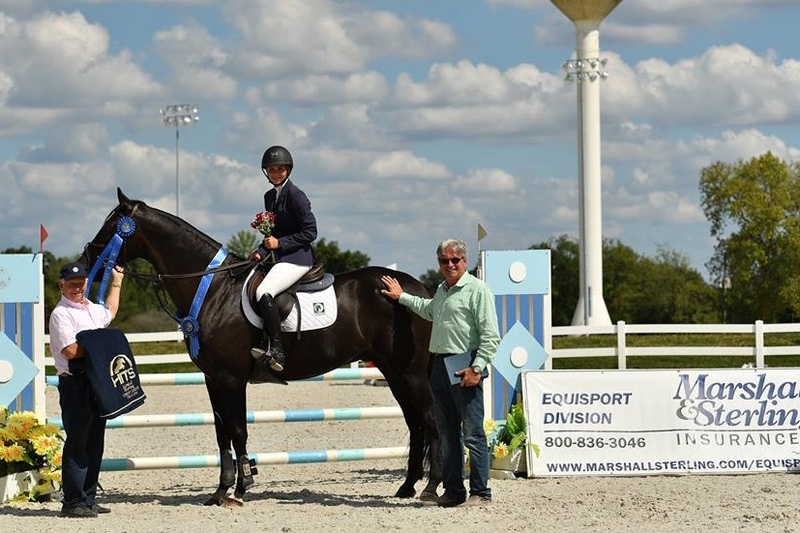 Each class added a work off of the top four riders as designated by judge Sue Ashe from Wellington, Florida to determine the champion. Winners are also honored at the IHJA Awards Gala in November and amazing award shots by Andrew Ryback Photography are displayed with video clips from Star Creek Video played back on two huge screens during the banquet. Adult Mini-Medal Finals winner Lauren Lackey with Perfecta Farm trainers Kim Gardiner and Mara Kranz Olseng. 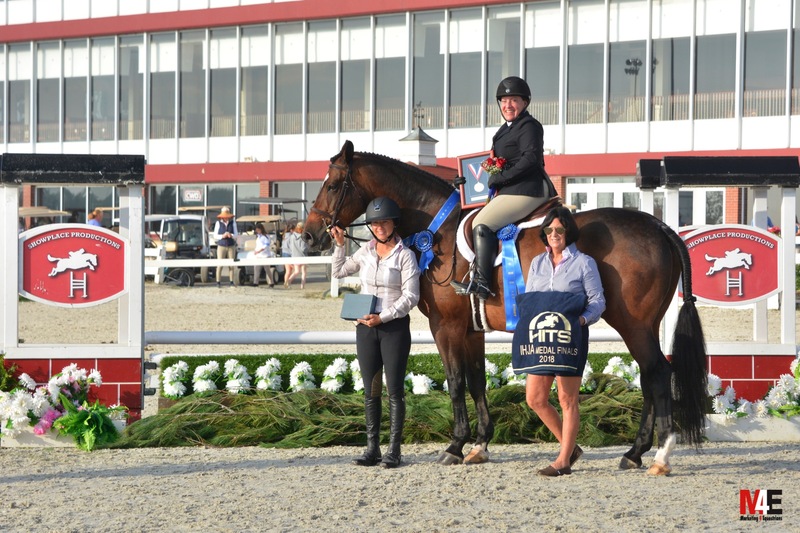 Children's Mini-Medal Finals winner Jorie Cattaneo with Judgement Farm trainers Tina Judge-Boyle and Lori Hollands. 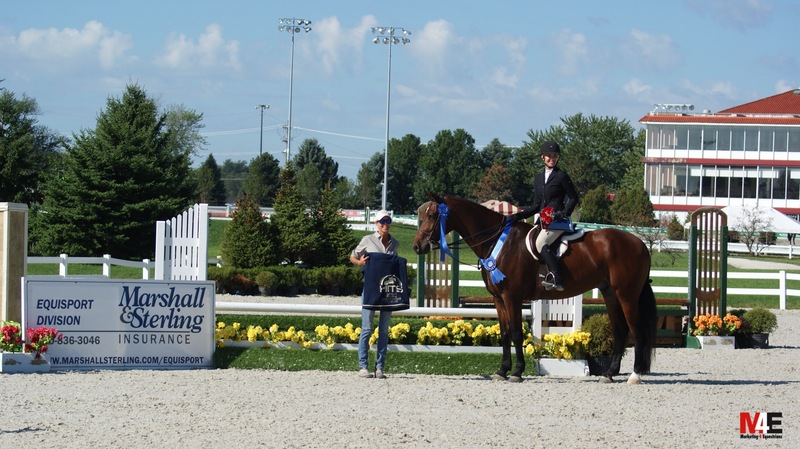 Pony Medal Finals winner Austin Bauman with Valley View Acres trainer Amber Bauman. Children's Medal Final winner Gillian Van Neck with Gateway Farm trainer Diane McClure. 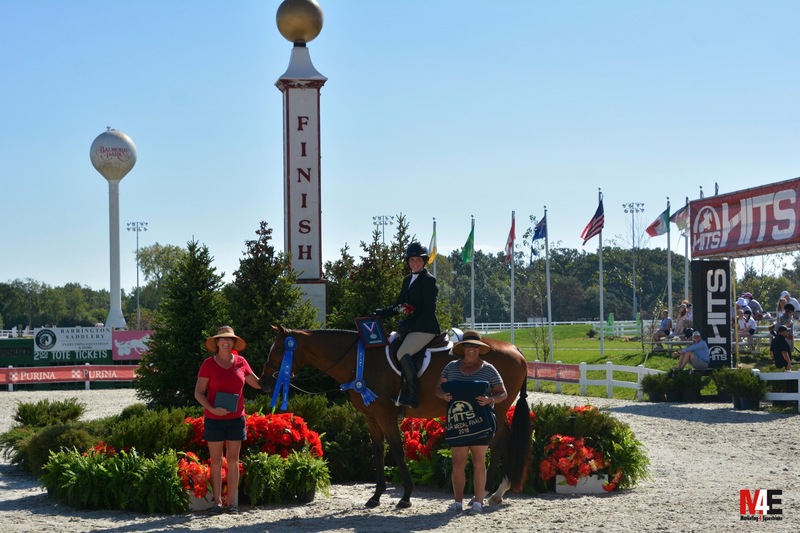 Adult Medal Finals winner Claire Elizabeth Patterson with Breakaway Farm trainers Abbie Dvorak Peat and Ginny Dvorak. 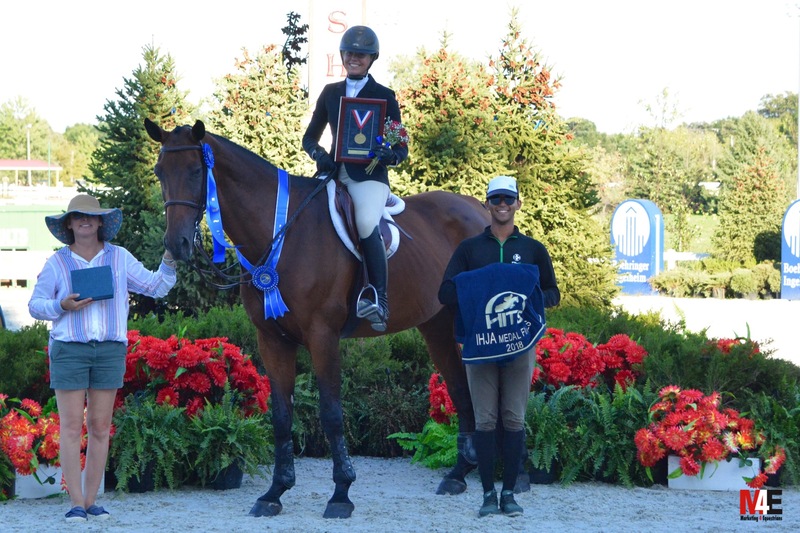 Junior Medal Final winner Paige Matthies with Northern Pines trainers Melissa Hirt and Gabriel Rodrigues. “We're having a great weekend! On the medal finals, it's great to have everyone in the grand prix ring, the jumps are lovely and our riders are doing well and winning. 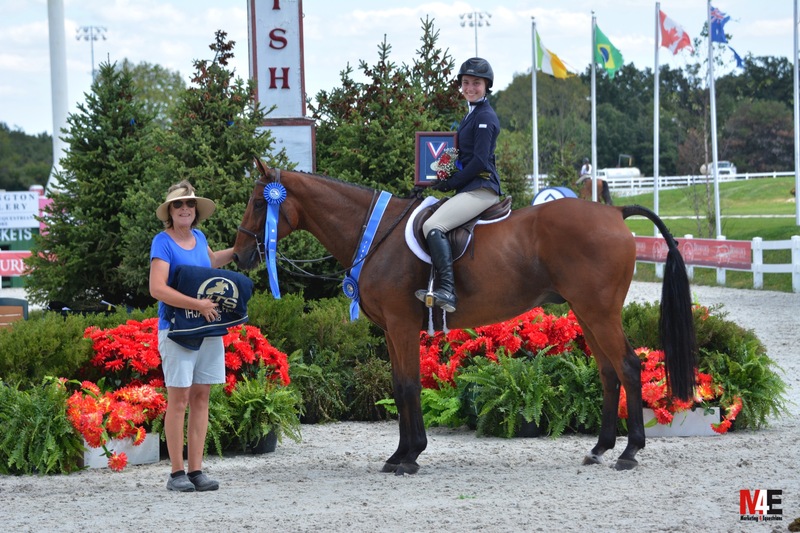 Ashley Scofield did the NCEA class and never competed in any equitation finals before and was stellar. I love the format of the class! It was educational for all the riders because they all stayed around to watch and learn from others. I also loved that the trainers of the horses we had to ride all gave pointers on the horses, even though they were competing as well. It was nice to see the camaraderie. "I love the finals horse show! Pat does a great job making it feel special and really making it the highlight of the year. I love Balmoral. I think they’ve done a great job developing the property and we’ve had a great time. We look forward to coming back next year." “Love the finals show. Finals is a standard horse show on our schedule, if we are going to go to regionals or out east, I make it mandatory that our kids come here because there’s a lot of options for classes and Pat uses different arenas, the courses are always challenging, the jumps are beautiful and the footing this week was excellent. I love Pat’s shows! M&S Adult Medal Final 2'6" winner Amy Martin with Camelot Farm trainer Sue Kavalik. 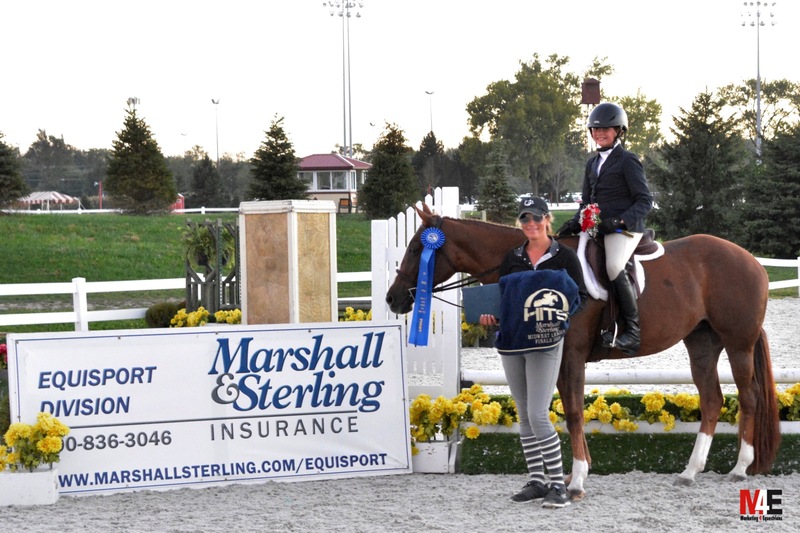 $500 M&S Novice CHildren's Hunter Final winner Cassini's Circo and Emily Orth with trainer Lance Williamson. M&S Children's Medal Final 2'6" winner Grace O'connell with Perfecta Farm's Ashley March. M&S Pony Medal Final and $500 Children's Pony Final winner Lasting Impression and Abygale Green with Platinum Farm trainer Sirena Liggett. Not pictured; $1,000 M&S Childrent's Hunter Final winner Aristea Santoro and Caramelo De Roca NPF, trainer Melissa Hirt. 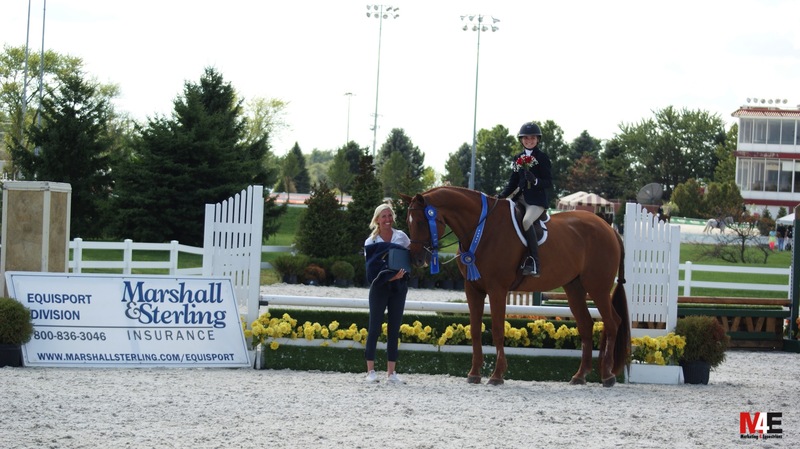 Congratulations to all the Showplace Fall Classic Winners!! 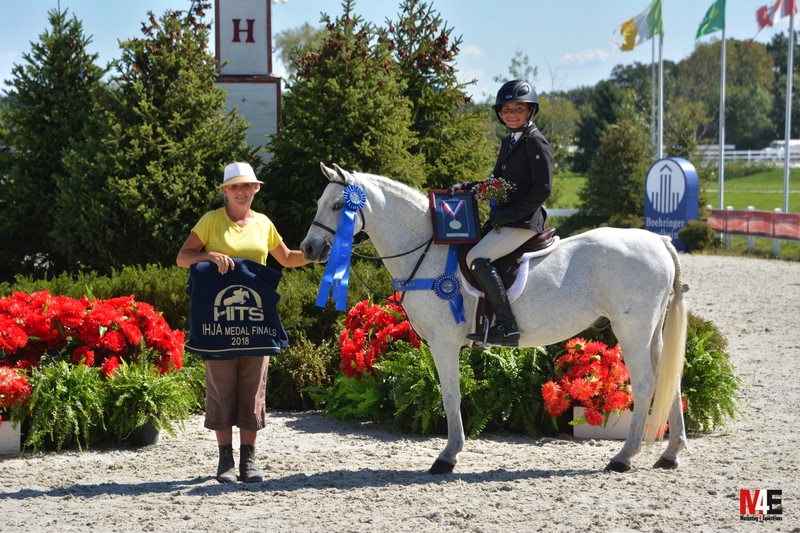 For complete results and a schedule of events, visit www.hitsshows.com. For livestream, go to www.showhorsetv.com.